Thornburg, Virginia (October 17, 2018) – The dominoes are already starting to fall into place for the Super Cup Stock Car Series and its premier facilities in preparation for 2019. The touring series, which will enter its 12th full season of competition and features 3,300 pound, 600 horsepower full-bodied machines, is announcing jointly with Dominion Raceway a partnership to host both the season opening and closing events in the upcoming year. Saturday, April 27 and Saturday, September 28 will be the official race dates. Dominion Raceway and Entertainment Complex is a multi-use facility equipped to serve fans and enthusiasts in many aspects. Its primary utilization is in the form of motorsports via its 4/10-mile oval, 2-mile road course, and karting and drag racing layouts; however, live music, parties, and community events are held at the 118 Bar and Grill venue on the property often intersecting with race weekends. Thornburg, Virginia and the surrounding area additionally offer opportunities for families to turn their stay into a vacation with sufficient lodging and dining options, state and amusement parks to explore, various historic monuments and museums nearby, and a short distance drive to major cities such as Richmond and Washington, D.C. The Super Cup Stock Car Series made its initial visit to the track, which broke ground in 2013 and officially opened its doors in 2016, at the conclusion of 2017. Ever since, drivers and teams have flocked back for a total of three more events that took place in 2018. A return in 2019 was already in the works midway through the current year. 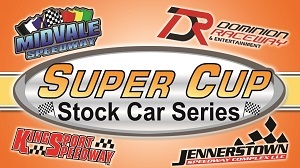 With identification of the unwavering support in which certain facilities have shown over time, the Super Cup Stock Car Series has been actively exploring in conjunction with each to formulate a Premier Track program. The intention is to build upon existing relationships for years beyond through various cross-promotions, which have become increasingly pivotal for the strength and forward movement of both the series and its members. Long-term associations with Ohio’s Midvale Speedway and Pennsylvania’s Jennerstown Speedway have been realized with an established following and impressive attendance at each SCSCS outing, proof that continual efforts will see a positive outcome for relative newcomers to the schedule like Dominion Raceway, Tennessee’s Kingsport Speedway, and any potential future facilities that display interest in coming on board. 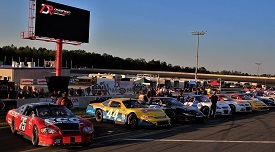 While 2017 and 2018 saw the Super Cup Stock Car Series test the waters with some special and non-points events to close out the year at Dominion, it will be the site in 2019 where those in the hunt for an overall title and other significant accolades will congregate for one final bout on the track and ensuing recognition at the season-ending trophy presentation during championship weekend. While the precise race format and added offers and chances for fan, driver, and team participation remain in the planning stages, any businesses or individuals interested in partnering for upcoming events are encouraged to contact SCSCS Director of Competition Joe Schmaling at JoeSCSCS@gmail.com or Dominion Raceway General Manager Edwin Pardue at Edwin.Pardue@DominionRaceway.com. More information regarding each event and a full schedule will be available as the start of the new season approaches at both www.dominionraceway.com and www.supercupstockcarseries.com. Be sure to stop by Facebook (search Super Cup Stock Car Series / Dominion Raceway in Spotsylvania Virginia), Twitter (@SCSCSRacing / @DominionRaceway), and Instagram (SCSCS_Racing / DominionRaceway) for continued updates and announcements that become available.